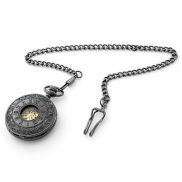 Pocket watches are gaining in popularity these days thanks to their retro appeal and beautiful designs! It is a men's watch with unique style and charm. We sell both mechanical movement and battery powered pocket watches with a full 2-year warranty. 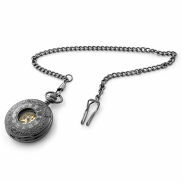 Pocket watches date back to the advent of the first clocks and were the only portable timepieces worn by gentlemen the world over. Because of their increasing popularity, we at Trendhim have chosen to offer a wide range of models like classic gold and silver as well different patterns and other rustic features. You really have to see how wonderful they are! We offer gold platted pocket watches. This keeps our prices competitive and we can thus deliver beautiful and unique pocket watches that will not cost you a small fortune. The silver colour comes naturally from the stainless steel casings. They are made in many different sizes and shapes, but typically the dial diameters are 4.5cm. These watches fit perfectly in waistcoat pockets and come with chains that have a variety of lengths and thicknesses. If you donât find the style you want call or write, we should be able to accommodate your request. There are two types: mechanical movement and quartz movement. As with wristwatches, energy sources are either supplied by an interchangeable battery for the quartz models, or actual winding in the mechanical movement.